Still stuck? Check out DoubleJump's Shin Megami Tensei: Persona 4 Official Strategy Guide! Shin Megami Tensei: Persona 4 (ペルソナ4, Perusona 4?) is a role-playing game developed and published by Atlus for Sony's PlayStation 2, and chronologically the sixth installment in the. 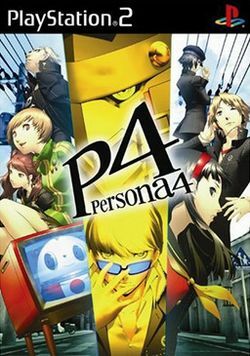 Persona 4 was released in Japan on July 10, 2008, in Korea on October 31, 2008, and in North America on December 9, 2008. Instead of the city locales of previous games in the series, Persona 4 takes place in a fictional Japanese countryside. It features a weather forecast system with events happening on misty days to replace the moon phase system (with events happening on full moons in Persona 3) implemented in the previous games. Its story is a suspenseful countryside murder mystery with multiple twists and turns in the plot. The North American package of the game will be released with a "Visual Data" book (most likely a collection of concept art) and a CD with selected music from the game, very much like Persona 3's North American release. This page was last edited on 6 January 2017, at 11:53. This page has been accessed 29,017 times.